In guidelines produced last year, the American Academy of Pediatrics advised parents to limit screen time to one to two hours a day for children between the ages of two and five years. New research suggests these recommendations aren’t producing the desired psychological benefits, and that the AAP’s recommendations are unreasonably strict. But given how much we still don’t know about the effects of excessive screen use on young children, there’s still reason for concern. In last year’s report, the AAP admitted that a one-size-fits-all approach is not the best strategy for parents when deciding how to limit their children’s screen use. 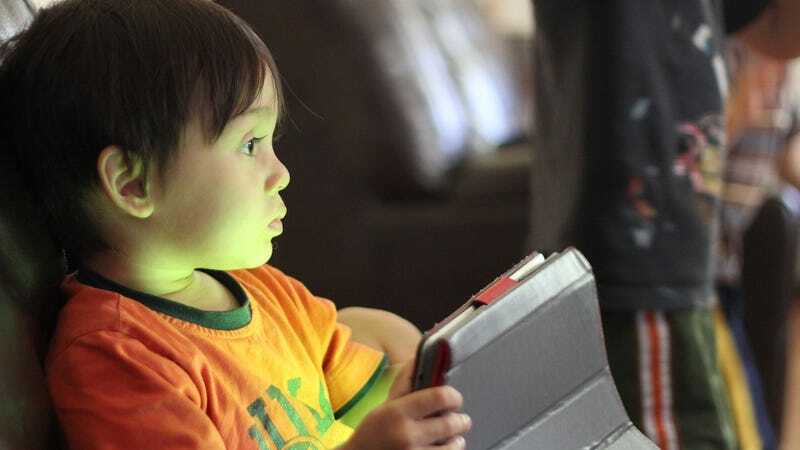 The AAP said children under the age of 18 months should probably avoid screens altogether (except apps like Skype and FaceTime), and that kids between the age of two and five years should have their digital screen use limited to about one to two hours daily. At the same time, only “high-quality programming” should be viewed, and preferably with parents present. These restrictions, stated the AAP authors, would be good for the psychological wellbeing of young children. New research published in the science journal Child Development now challenges these assumptions, stating that the existing guidelines aren’t producing the desired results. At least not on the psychological side of things. The new study, led by Oxford University’s Andrew Przybylski and Cardiff University’s Netta Weinstein, assessed the impact of screen time on children aged two to five. Przybylski and Weinstein talked to nearly 20,000 parents over the phone, asking them how much screen time their kids were getting and about general wellbeing, which was measured in terms of caregiver attachment, emotional resilience, curiosity, and mood. Excessive screen time, the researchers observed, was not having a particularly negative effect on the kids. “Evidence did not support implementing limits (< 1 or < 2 hr/day) as recommended by the American Academy of Pediatrics, once variability in child ethnicity, age, gender, household income, and caregiver educational attainment were considered,” conclude the researchers in the study. That said, reducing screen time did result in boosts to a child’s resilience (i.e. ability to quickly get over frustrations or setbacks)—but it produced a grumpier mood. The researchers also learned that screen time increases with age and is higher in boys, non-white children, children with less educated parents, and less affluent households. The researchers also said the AAP guidelines were based on out-of-date research, which used data collected at a time prior to when tablets and smartphones became to ingrained in daily life. So what are we to make of these results? At one level it suggests that parents shouldn’t be overly concerned if their two-to-five year old spends more than a couple of hours in front of a screen each day. But it’s important to point out that this study was limited to purely psychological, parent-reported measures of wellbeing. Other research has linked excessive screen time among young children to sleep problems, speech delays, and behavioral problems, so it’s overly simplistic to say this new study is an excuse to ignore the AAP’s guidelines. Also, the researchers relied on self-reported data for this study. While the sample size was a healthy n=19,957, the scientists had to take the words of the parents at face value. What’s more, they didn’t actually directly study or observe any of the children involved. It’s still early days in this important area, so for now it may be best to err on the side of caution. We reached out to several experts in this area for their opinions, and we’ll update this post once we hear back.